The First Dozen Changes to My Newly Reinstalled Windows 10 - Ask Leo! I decided it was time to reinstall Windows 10 “from scratch” on my Dell Latitude laptop due to performance issues, suspected misconfigurations, and general cruft on the machine. Yes, I could have dealt with all the individual issues, but a completely clean reinstall would take less time and result in a significantly “cleaner” machine. It used to be that “reformat and reinstall” was something Windows needed every year or two. That’s no longer the case, in my opinion, for most Windows 10 users. It’s quite reasonable to expect a stable Windows 10 installation (with updates, of course) to remain in place for the life of the machine. As you might guess, though, I don’t fall into the category of “the majority of Windows 10 users”. With all the testing, installing, uninstalling, configuring, reconfiguring, and more, I tend to be rather hard on my Windows installations. So, it was time to start over. Before reinstalling Windows 10, I created a complete image backup, using the free edition of Macrium Reflect. This is my safety net. Should anything about the reinstall go bad, from an actual failure to an accidental “oops, I didn’t mean to delete that”, a complete backup image would save me. I’d be able to restore the entire machine to the state it was in at the time of the backup, or I could recover individual files as needed from the backup. If you’re considering the “nuclear option” (a reformat and reinstall) to resolve computer issues, take a complete image backup before you begin. Just in case. I used Windows 10’s “Reset this PC” to install a fresh copy of Windows 10 and erase everything that was already on the machine. Normally, I’d not install a browser first, but I needed it to download step 2, below. This was an install of convenience. My laptop lives in our family room, and I work in my home office. Rather than walk back and forth for every step, I wanted remote access from the beginning, and TeamViewer is my current choice. This allowed me to continue other work while various installations completed. This might have taken the longest. I visited the Windows Update page in the Settings app and had it check for updates repeatedly, installing all that were available at each point. This included the most recent major update, the “Fall Creators Update”. I prioritized updating Windows over installing additional software for two reasons: in a subsequent step, I take a snapshot backup image that might be used in lieu of a reinstall in the future, and I don’t know what software will be appropriate to have installed should that ever happen. I also want Windows to be solid and stable before installing additional software, so if conflicts arise I can more easily identify the culprit. I make rather heavy use of OneDrive these days, and I wanted it configured and in place before the next step. This means that in addition to enabling OneDrive, I let it download and mirror all the files currently in my OneDrive storage to the laptop. Forty-six gigabytes later, OneDrive was up to date. I installed Macrium Reflect and created a complete image backup of the entire hard disk. Then I saved that backup image to my archives. In the future, should I ever feel the need to “reformat and reinstall” this laptop, I can restore this backup image instead, saving me all the preceding steps. The only thing I’d need to do after restoring the image is revisit Windows Update for any updates. This isn’t an installation as much as it is customization. While it’s really an ongoing process, I mention it at this point because for me, this is when it really starts. I pinned common applications (like Firefox) to the taskbar. I changed the notification area to show all icons always, and then disabled individual icons as needed — for example, I don’t need the Dell mousepad indicator to be visible at all. I cleaned up my desktop so only the Recycle Bin remained visible, and so on. Next, I installed Evernote. I’m a heavy Evernote user, using it for everything from random notes to my daily “to-do” list. Xplorer2 is one of several Windows File Explorer alternatives. I started using it years ago, and have come to rely on its dual-pane interface to make copying and moving files somewhat easier. It’s exceptionally customizable, and generally a useful and functional alternative. I’m also a heavy user of Dropbox. I use it to share files with my staff, as well as quickly make a file publicly accessible for a short while. Like OneDrive, it keeps files accessible across multiple computers and mobile devices. I use Cryptomator to encrypt the sensitive data I store in OneDrive. This allows me to fully, safely utilize OneDrive’s cloud storage and synchronization to back up my important files as well as automatically replicate them across the many machines I use. OK, ok, WoW is my guilty pleasure. I make no excuses. I found myself sitting in the family room wanting to check something in the game, so I went ahead and installed it. This laptop is in no way a “gaming” machine, but it’s useful for a few administrative tasks. To be completely honest, I paired the headset to this laptop so I could demonstrate multiple output devices in an Ask Leo! Tip Of The Day. It’s also convenient, at times, to be able to listen to something on the laptop without disturbing others in the room. For the record, the headset is a Plantronics Backbeat Pro. It’s served me well for several years now, and there are newer models available. Since putting that list together, I’ve installed Microsoft Office 365, but that’s about it. So much of my work has moved online that the urgent need to install a large number of applications on the laptop itself has decreased dramatically. The web browser installed in step one made the laptop almost instantly useful for a wide variety of operations. …subject to whatever tests and experiments I might run as part of answering Ask Leo! questions, of course. I reinstalled Windows and lost a file on my desktop, what can I do? - When you reinstall an operating system it overwrites everything on your computer. If you didn't backup a file, you are going to have a hard time finding it. 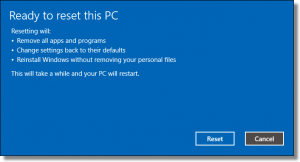 Reinstalling Windows 10 from Windows 10: “Reset This PC” - Windows 10 makes it relatively easy to reinstall Windows and keep most of your data while doing so. How Do I Upgrade Windows When I Can’t Actually “Upgrade”? - Unfortunately an upgrade isn't always an upgrade, sometimes it's a complete replacement. Why did you install from scratch instead of restoring from your original “bare bones” backups? Did you wait for the entire OneDrive sync before taking the step 5 backup so you would back everything up? It would take a couple of days to fully sync. Why do you use Dropbox to share files instead of OneDrive which has that capability? I think I know the answer to that one, because I do the same. My reason is that some of my students said that they were asked to log on to their Microsoft account when some didn’t have a Microsoft account. Leo has been recommending Windows Defender for many years. But since Windows 10 has Defender pre-installed, there’s still no rush to install a third party antimalware program because you are already protected, so you can install it at any step in the process. TrueCrypt is now obsolete, but I thought you were a Veracrypt fan. Maybe I’ve not been paying attention, but this is the first mention of cryptomator.org that I’ve heard of. Why the change? pro’s con’s? Actually … I’d not consider a Windows ‘reset’ as the nuclear option. Although it deletes Windows programs, it keeps Windows ‘Apps’ and I see you also wanted to keep your files. But you already knew that . After the clean install of the newest Windows version, recover your files from backup and you’re off! BB, windows reset have two options, keep your files or destroy everything. The destroy everything functions like a nuclear solution and it only take a few steps(Windows does the installation for u). Its faster than than downloading a new copy of windows(1-4 hrs), flashing the iso file into the usb stick (10-30 minutes) or burn it in cd/dvd and booting it up and installing(1-3hrs). Note: time depends on the internet speed and machine specs. Youre partially wrong about the product key, it only works if you installed the OEM OS of the device also it doesn’t affect the speed of the installation. The windows installer would still ask for the version of windows that you have, its not automatic. If you pick the wrong version, youre gonna do the installation all over again cuz it will not validate. Why the preference for a blue-tooth headset over a wi-fi one? My bad. Perhaps at some point you could do an article on the different types of wireless communication as I had assumed (very incorrectly) that most wireless was accomplished with wi-fi and I also thought that blue-tooth was on its way out. I see now I was very wrong. Also does WPA2 that the vulnerability was found in recently apply to other types of wireless technology? It is interesting to see how different people organise themselves differently. In my case Dropbox, Notepad++, PasswordSafe, Windows Sysinternals and Chrome are my first priorities. Also in that group, but as paying apps, are BeyondCompare (an amazing piece of software), and Symantec Encryption Desktop. After that it becomes a hotch-potch of what I need to do various things, e.g. Skype, OpenOffice etc.